The Minnesota Mutual Life Insurance Company Building, located in Saint Paul Minnesota, was approved for listing in the National Register of Historic Places by the Minnesota State Review Board in March 2017, and is currently awaiting final review and listing by the Keeper of the National Register. PVN worked with a developer to determine that the building is historically significant under National Register of Historic Places Criterion A as the home office of the Minnesota Mutual Life Insurance Company and under Criterion C as an early example of an International Style office building in Saint Paul. The building is currently being rehabilitated as housing. PVN is proud to be part of a team that is leading the way in the preservation and rehabilitation of Midcentury buildings in St. Paul. Find the other blog posts in the Minnesota Mutual series here. Minnesota Mutual’s choice to build a thoroughly modern, International Style office building out of regional materials was a specific marketing decision – one that was gaining popularity in forward-thinking corporations around the county. 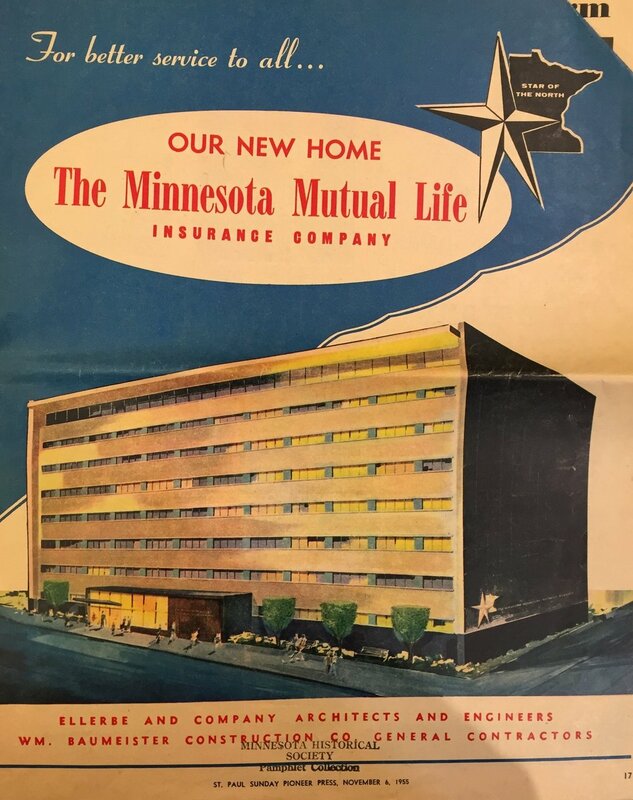 As was common for corporations embarking upon post-war building campaigns, during the construction of their new Home Office, the Minnesota Mutual Life Insurance Company also rolled out a new brand identity, which turned the building itself into the symbol of the company. In his speech at the groundbreaking, President Cummings noted that the building at 345 Cedar was a chance for the company to look to the future, a “sign that [the company was] just starting to grow.” A new company seal, featuring a simplified drawing of the new building’s primary façade, was unveiled in March 1954. The new seal was featured on all written company materials, visually associating the 75 year old enterprise with innovation and modernity. 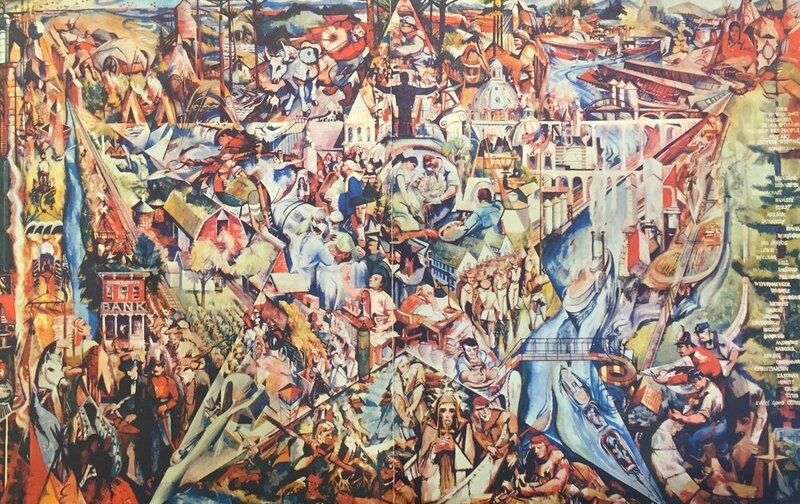 Simultaneously, the company marketed itself as “growing with Minnesota.” An oil on canvas mural by local artist Birney Quick was commissioned to hang in the lobby of the new building – the subject matter of the mural was to be Minnesota and Minnesota Mutual Life Insurance Company. At the building dedication on August 6, 1955, President Cummings asserted, “Our company name is Minnesota Mutual. It has been suggested many times that we change the name to something less provincial, something suggestive of the nation-wide institution which we have become. But we are proud of our name! (emphasis Minnesota Mutual’s)” At the ceremony, and in the building lobby for a time following the ceremony, Minnesota Mutual distributed a pamphlet intended to facilitate self-guided tours of the building for visiting field agents as well as the public. The pamphlet highlighted the various stones used at the exterior and throughout the interior public spaces, the “all glass front entrance and lobby,” elevators which were “the latest word in design and safe operation,” and the state of the art air conditioning and circulation system. This pamphlet touched on the many ways that Minnesota Mutual and architects Ellerbe and Company used the standard language of International Style architecture to modernize the “provincial” insurance company’s image. The building’s simple horizontal massing and unfussy geometric exterior details immediately set it apart from its vertical late nineteenth and early twentieth century neighbors. The building’s horizontal proportions speak to the sense of optimism and expansive economic opportunity that pervaded the country following the war. Long ribbon windows at each floor further emphasized this horizontality, while also highlighting the use of a modern curtain wall, completely unlike the bearing wall buildings with their punched openings made up the rest of downtown Saint Paul at the time. Furthermore, the ribbon windows combined with the floor-to-ceiling glass at the lobby served as a nod to operational transparency. By contrast, the use of local Kasota stone kept the building from feeling out of place in Minnesota. Staff finally moved into the building in late October of 1955 and, in early November, Saint Paul extended one final congratulations to Minnesota Mutual Life Insurance Company in the form of a special section in the Sunday, November 4th edition of the St. Paul Pioneer Press. The special section included a full color rendering of the building, exterior and interior photos and a detailed description of the building, a history of Minnesota Mutual Life Insurance Company and congratulatory ads from other businesses ranging from American National Bank, to Prudential Life Insurance Company, to 3M, to the local steelworker’s union, to Seestedt Carpets, to Dayton’s. In his 1953 speech at the groundbreaking ceremony, President Cummings stated that the Minnesota Mutual Life Insurance Company intended to outgrow the building at 345 Cedar before 10 years had passed; while the company did not physically outgrow the building fast enough to meet this aggressive goal, it did see successful financial and programmatic growth between the 1950s and 1980s. In 1955, Minnesota Mutual’s 75th anniversary year, the company boasted nearly $1.5 billion worth of insurance in force and “several hundred thousand policyholders throughout America.” Over the next few decades, Minnesota Mutual remained a major player in the national life insurance industry, pioneering the use of direct mail policy applications in the 1960s, introducing joint life insurance policy options in 1975, and by the company’s centennial in 1980, reaching the status of largest mortgage life insurer in the country. Similarly, Minnesota Mutual’s insurance in force grew steadily, reaching $2 billion in 1958, $3 billion in 1962, $10 billion in 1970, $20 billion in 1975, and $35 billion in 1980. 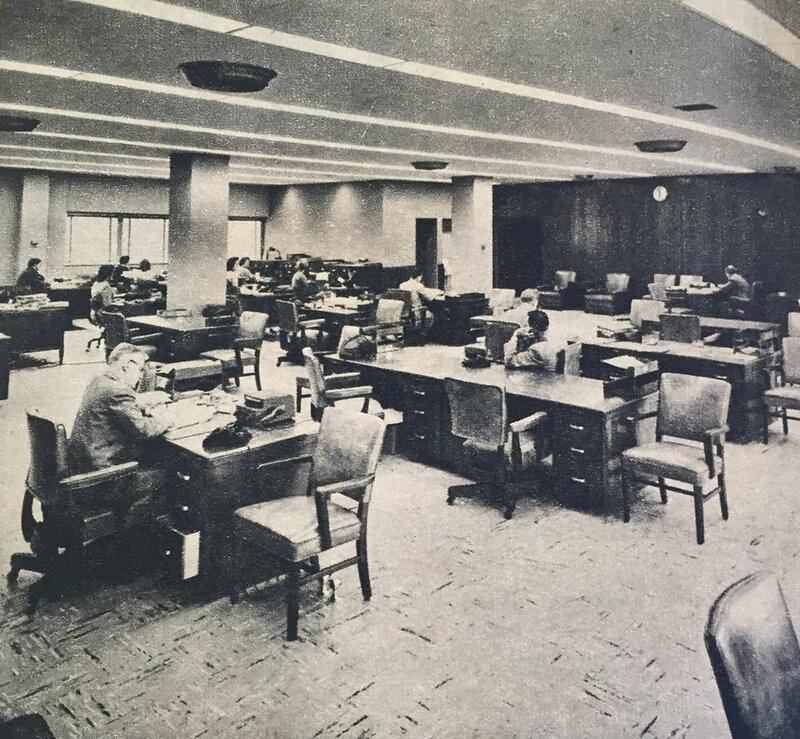 All this while remaining notable in Saint Paul as a homegrown company, Minnesota Mutual’s major “local” competitors in the twentieth century—Guardian Life Insurance Company of America and Travelers—both maintained offices in Saint Paul, but headquartered on the east coast. Based on our growth projections, it has been concluded that the present home office will soon be outgrown. As a major participant with two Twin Cities firms, Minnesota Mutual Life plans a 41-story office tower, banking and retail complex in downtown St. Paul. Construction of the 800,000 square foot structure is expected to begin in late 1970. The Building, identified as The Minnesota Mutual Life Tower, will serve as the Company’s [sic] corporate headquarters. The new building was not realized until over a decade later, when what was ultimately a 21-story tower at Robert and 7th streets was completed in 1982. In the meantime, Minnesota Mutual Life Insurance Company enacted stop-gap measures to accommodate their continued growth. These measures included moving entire departments to rented office space elsewhere in downtown, and in 1970, constructing a building in an industrial park north of downtown to house the company’s service departments including printing, mailing, record keeping, and storage. In 1982, the home office at 345 Cedar was purchased by EcoLab, which occupied the building for just a year, before selling to the St. Paul Pioneer Press, who operated out of the building for the next 30 years. Leland M. Roth, American Architecture: A History (Boulder, Colorado: Westview Press, 2001) 412-413. Minnesota Mutual Life Insurance Company, “Dedication Address,” Application (Official Publication of the Minnesota Mutual Life Insurance Company Saint Paul, Minnesota), August 1955. “Pamphlets Relating to Life Insurance in Minnesota, 1889–“, Minnesota Historical Society Pamphlet Collection. Kasota stone is a type of limestone indigenous to southern Minnesota, and generally quarried near Mankato. St. Paul Pioneer Press, Special Section, November 6, 1955. Physical copy available - “Pamphlets Relating to Life Insurance in Minnesota, 1889–“, Minnesota Historical Society Pamphlet Collection. 75 Years Developing with Minnesota, 26. In comparison, the national mean average for life insurance in force reached $150 million in 1960, $270 million in 1970 and, $3.2 billion in 1980. Wright, 22-23 and Looking Ahead. Minnesota Mutual Life Insurance Company, 1968 Annual Report, 9. Minnesota Historical Society Collections.